Omega Natural Language Understanding (NLU) product is an Artificial General Intelligence (AGI) that read documents, understand the knowledge content, then answer questions about the content. More information about Omega and a use case at a Major Wall Street bank. The Gamma project provides framework and reference applications that you can use to add Prediction and Recommendation service to your business applications. Stay tuned for demos and downloads. The Datum Universe is a graph of datums that contains thousands, millions or billions of datums and connections. We have developed various visualization abstractions that allows us to view, understand, and interact with the knowledge content in the graph. We continue to innovate and design new visualizations. See the Universal Visualizer in action and Download DUV – a visualizer for the developer. 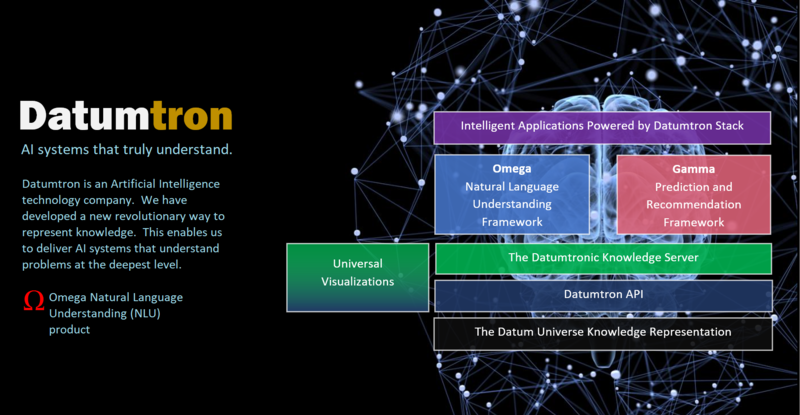 Datumtron Sentiment is a sentiment analysis product powered by the Natural Language Understanding technology of Omega. Resumetron Is a web application that manages your resume online using Artificial intelligence. Resumetron is totally built using Datumtron technology stack.